James Dulkerian is a doctor of physical therapy specializing in orthopedics, sports rehab, and manual therapy with return to activity, without resorting to surgery, injections, or pain medication. He believes in preserving high quality care that patients deserve through one-on-one treatments. 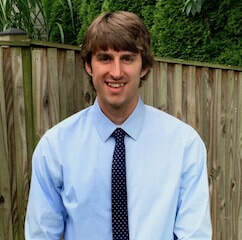 James graduated from Ithaca College in December 2008, with his DPT, and has practiced back home in Maryland ever since. He offers personalized, holistic solutions to treat a variety of orthopedic conditions. Wellness programs, and sport specific training are offered as well. He is the only health care provider certified in myofascial decompression in Maryland and the first to offer direct care physical therapy via a mobile clinic in the country. When not working James enjoys spending time with his family, traveling, and staying active in the outdoors with activities such as surfing, mountain biking, and snowboarding. As a native of Maryland, lacrosse was his favorite team sport to play with a lacrosse stick in hand since he began to walk.